Celery is one of those veggies that’s mostly made of water. And despite it’s nearly flavorless taste, it’s actually quite rich in a variety of nutrients like vitamin A, vitamin B6, vitamin, C, vitamin K, folate and potassium. That’s great news for people who never get tired of eating it with a bit of peanut butter or hummus. But what about the rest of us? No offense to celery, but a lot of people would probably agree that it starts to get rather bland pretty fast. So here are a few more creative and better tasting ways to use celery when you’ve got a bunch sitting in the crisper. Throw it in your green smoothie. Green smoothies are the perfect solution to getting a huge load of veggies into your diet without feeling like you have to force down a massive salad. Since celery is great for weight loss, digestive health and combatting inflammation, try it in a detoxifying green smoothie by blending two fresh stalks with an apple, a medium-sized cucumber, a few kale leaves, a large bunch of spinach, a large punch of fresh parsley or cilantro and one lemon. Braise it for a healthy side dish to a main meal. Braising involves pan-searing the celery first before cooking it in liquid over low heat. 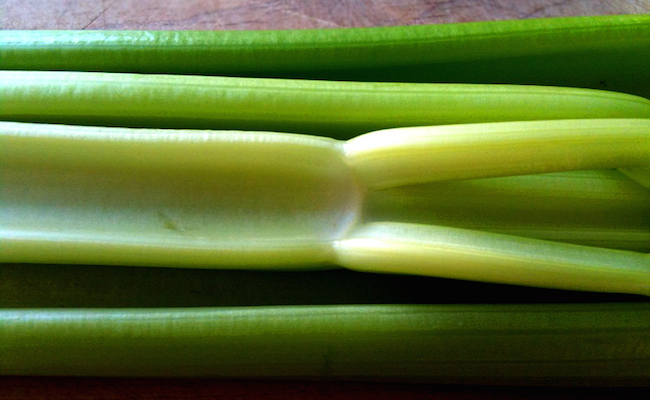 When it’s cooked, celery has a sweeter flavor to it than it does when it’s raw. All you have to do is cut some celery into chunks, cook it over medium heat with some butter in a skillet until it’s tender, add half a cup of your broth of choice and cover it to let it simmer on low heat for about five minutes before serving it with a dash or two of your favorite seasoning. Slice up some thin, curly pieces to add to a salad. Since celery barely has any flavor in its raw state, it can make a great addition to almost any salad. You could even use it in a healthy fruit salad by slicing up an apple and a pear and then tossing it in a bowl with thinly sliced celery pieces, some chopped parsley and some celery leaves. For a yummy dressing to top it with, whisk together two tablespoons of lemon juice, two teaspoons of honey, four tablespoons of olive oil, three-quarters of a cup of parmesan cheese, plus salt and pepper to taste. Make soup out of it. If you have a full head of celery that seems to be a a day or two away from going completely limp, there’s no better way to save it than by making a creamy soup out of it. This amazing recipe from Erren’s Kitchen is actually for a no-cream creamy celery soup, meaning that even vegans can enjoy it. Anyone who’s ever pickled their own veggies (or at least wants to try) should consider using this brine pickling technique with celery. In addition to the brine solution, all you need are two garlic cloves, a quarter-cup of sliced onion, a bunch of fresh dill, a bunch of celery (of course) and some mason jars. Now there’s a way to really take the flavor notch up by several levels on such a flavorless vegetable! Celery really doesn’t have to be so boring. In fact, if you do some digging around for some more creative recipe ideas, you’ll probably find that it’s just as versatile as any other vegetable. I apologize to all the vegan people reading this I know the cream cheese was one step over the edge. I hope I didn't turn your stomach too much. Vegetarian here. I think celery tastes just fine all on its own. I cut the celery into pieces and put it in a glass of water in the fridge when you open the door and you looking for something to eat you grab a couple of pieces of celery and you stay thin. Keeps you away from all the fattening foods. It's also good with cream cheese on it LOL. Second article on celery: it seems to have become very fashionable indeed.